Sarah received her Doctor of Audiology (Au.D.) from the University of Massachusetts Amherst in 2015 and joined Tucson Ear, Nose and Throat after graduation. 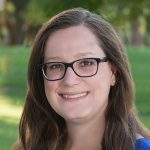 Sarah is a member of the American Speech-Language-Hearing Association (ASHA) and has her Arizona State Hearing Aid Dispensing license. She enjoys the diverse clinical environment at Tucson Ear, Nose and Throat. In her free time, you can find Sarah at the gym, visiting with family and friends or out exploring the world!